Ti has been well-known to everyone as a collector of waste engine oil in Thuan An town in Binh Duong province. His everyday work is going to car repair shops to collect waste oil in Binh Duong province and HCM City, then reselling to those who recycle the waste oil for selling on the market as genuine oil. “I can provide as much as you want. If you want to recycle the waste oil, I can show the places where you should come to buy the chemical substances to create an odor for the products, and buy cans and bottles,” Ti said to the reporters, who asked him about what the oil would be used for. Minh Truong Company has a kiosk specializing in distributing industrial chemical substances at the Kim Bien district in HCM City. A salesman at the kiosk said there are a lot of odorous chemical substances available here, from the ones which can create flower scent to that which create fruity flavor, priced at between 300,000 and 400,000 dong per kilo. He went on to say that the most favorite product now is the one with singum ordor, priced at 350,000 dong per kilo. One liter of the singum-odored product can be used to make 100 liters of oil, which would create a pleasant odor to the waste oil, while it would not change the color of the oil. The production line is now available on the market at the price of 900 million dong, while the suppliers would be in charge of installing the production line and provide warranty service. Van Thanh Company in HCM City has been known as the biggest recycled oil distributor in the southern market, from which oil products would be carried to the east and west of the southern region and Central Highlands and sold as the high-end products with diversified labels. 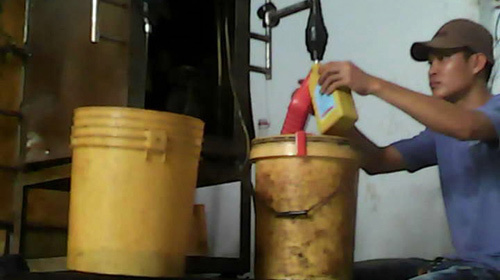 Van Thanh recycles waste oil at a workshop covering an area of 1000 square meters. The production line here seems to be very “modern” with large tanks containing oil with faucets leading oil to bottles and automatic bottling machines. Huong, who introduced herself as the manager of the workshop, said the workshop only fulfills big orders, while it would not accept small contracts. Bottled oil churned out by the workshop is selling at 26,000-35,000 dong per kilo, depending on the proportions of recycled oil and import original oil (the high quality oil refined from crude oil). The most popular proportions are 3 (original oil) – 7 (recycled oil) or 4-6 and 5-5. Also according to Huong, the workshop sells recycled oil at 26,000 dong per bottle, while the wholesale buyers would later decide their retail themselves, after giving the products different labels. Cuc, the owner of a motorbike repair shop on Nguyen An Ninh road in Di An commune, has warned that the recycled oil products would harm engines. Truong Ngoc Thanh from GS Oil, a product of GS – Caltex Group, said that genuine products are made of the high quality original oil refined from crude oil (making up 80-99 percent of the finished products), additives (1-20 percent) and some other substances like lubricant or antifreeze. In recycled oil, the bad lubrication would make cars and motorbikes break down regularly and rapidly erode the engines.